The Hampton Inn Pickwick Dam-At Shiloh Falls hotel is located in Pickwick Dam Tennessee at the corner of Highway 57 and 90 Old South Road at the entrance to Shiloh Falls a master planning golf community. The hotel is situated on the Shiloh Falls Golf Course and just 12 miles from Shiloh National Military Park. 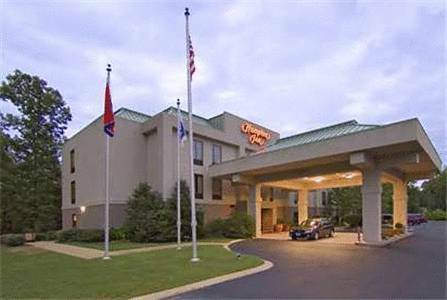 Within 3 miles guests of this Pickwick Dam Tennessee Hampton Inn hotel can dine at John*s Pier Rib Cage Redwood Hut or Freddy T*s Restaurant. The Hampton Inn hotel in Pickwick Dam Tennessee features complimentary continental breakfast complimentary local calls in-room coffeemakers iron/ironing board and TV with cable. Additional amenities of the Tennessee hotel include an outdoor pool boat hook up refrigerators suites connecting rooms cribs and our 100 Satisfaction Guarantee. Laundry/valet services meeting/banquet facilities and an exercise gym are all available to our hotel guests for a nominal fee. We love having you here at the Hampton Inn Pickwick Dam-At Shiloh Falls hotel in Tennessee. ~51 miles from Pickwick Dam. ~59 miles from Pickwick Dam. ~70 miles from Pickwick Dam. ~78 miles from Pickwick Dam.